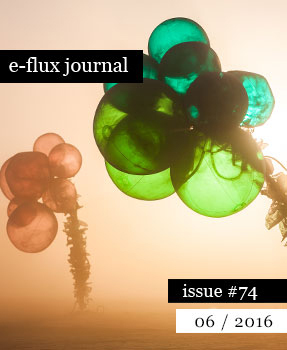 In e-flux journal, Number 74, eds. Julieta Aranda, Brian Kuan Wood, Anton Vidokle, and Stephen Squibb. This essay has been translated into German for WOZ Die Wochenzeitung and slow media; into Spanish for Revista Código and Revista 404; and reprinted in The Anti-Museum: An Anthology, Walther Koenig, 2017.